Saturday July 28th, 2018 – The Irish Examiner’s Peter Dowdall wrote an excellent piece on the Jardin de la Paix, garden of peace I am realising at Peronne Castle, France; now home to the Historial de la Grande Guerre. 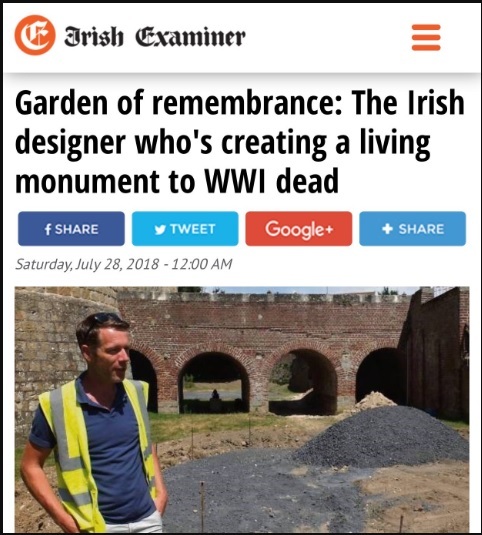 A story of a Garden of Remembrance and this Irish Designer. Garden of remembrance: The Irish designer who’s creating a living monument to WWI dead. LAUNCHING in October 2018, in the Hauts-de-France region of France, a century after the Great War, is a project which will serve as a lasting and living monument to the countless dead who gave their lives between 1914 and 1918. The project will bear witness to the number and diversity of the countries involved in this conflict and will comprise of 15 gardens of remembrance created near the memorial sites of the Great War. Art & Jardins Hauts-de-France and the Great War Centenary Mission, who are managing the project, have selected top international garden designers representing the nations affected by this global conflict. On an individual level, gardens can serve as a great place to remember people, I have countless plants in my garden that were given to me by people now since passed and I stop and think of the person who gave it to me, and perhaps feel a bit closer to them once more. If that’s not prayer then I don’t know what is? Perhaps it’s because, in a garden, the energy beneath is being cherished and given the opportunity to create magical displays which make us feel closer to God or nature, call it what you will, and also closer to those now gone, Or perhaps, it’s just because we tend to slow down and forget, for a while, about the pressures of the outside world, when we are in the garden. Whatever the reason, I can’t think of a better or more worthwhile way of commemorating those who lost their lives in that horrific period of the 20th century. The building of the Jardins de la Paix (Gardens of Peace), a series of perennial gardens on the theme of peace started earlier this summer. 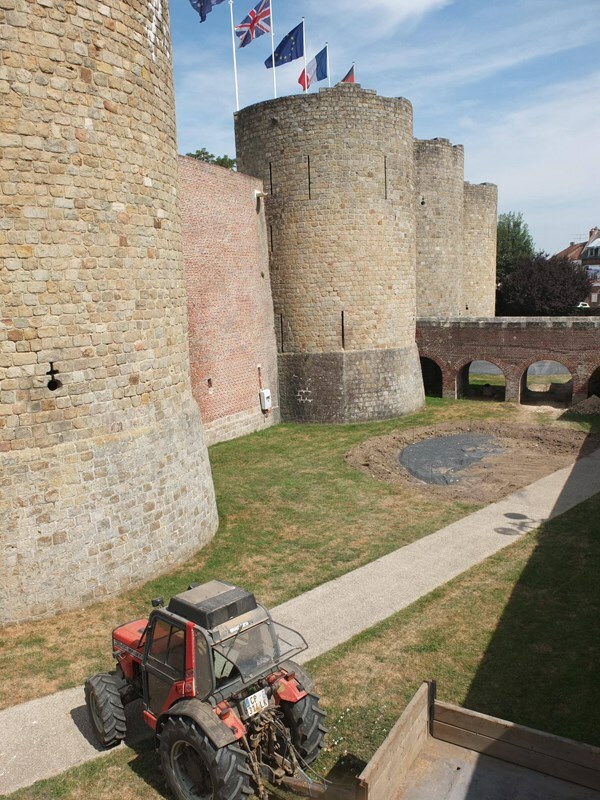 The first of the gardens is to be created in the moat of the 13th century Chateau de Peronne, a medieval castle badly damaged during the First World War and the emblem of the city, in the Somme region of Northern France. The designer, selected by the French jury to represent Ireland, is Ballyboughal-native Peter Donegan, one of 14 international garden designers chosen to create monumental gardens as part of this plan. 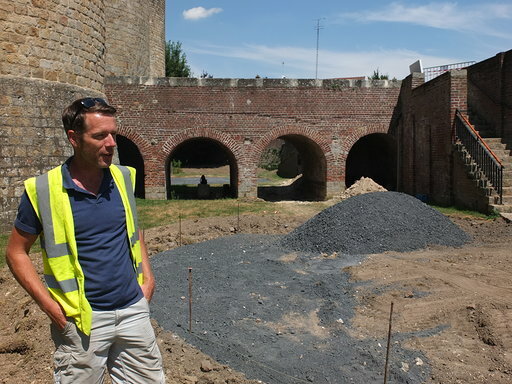 Having met with the Mayor of Péronne just last week and with all permissions granted, Donegan has taken up a residency in the region to oversee the build since July of this year, and will be there until October. The battle of the Somme was fought by the British and French against the Germans. It was one of the deadliest battles in history, with about 1,060,000 casualties, including about 442,000 dead or missing (420,000 of them were British). This remembrance project is initiated by the Association of Art & Gardens – Hauts-de-France and by the First World War Centenary Partnership Programme, in agreement with the French Ministry of Culture. Created by landscapers from countries which fought in the region, these artistic gardens will be grouped in clusters of three to four gardens, each located near Great War memorial sites and memorial tourism routes. Along with Peter Donegan providing Irish input, Chelsea Gold medal-winning designers James and Helen Basson will represent England and Andrew Fisher Tomlin, a former selector of judges for RHS Chelsea Flower Show along with Dan Bowyer, are flying the Welsh flag. These gardens will be a permanent memorial and it is quite an achievement, not to mention an honour, for Peter Donegan to be selected by the French jury to represent Ireland. Taking his inspiration from Dún Dubh Cathair on Inis Mór, which has a similar limestone base to the 13th Century castle in Peronne, Donegan will add a nice little twist. “The walls and the moat of the castle were built to keep people out originally and are a reminder only, of times past — this garden, named Jardin Eutychia after the Greek goddess of happiness, will be used to encourage people to come inside.” This garden will be all about inclusiveness and bridge-building so to speak. “Three mature Betula jacquemontii will be planted inside the castle walls, which will be just visible from the outside, the idea being that they will be like hands waving, beckoning you inside,” says Donegan. The only entrance into the garden will be over a bridge which brings you into the castle, with all the symbolism that that provides. On the other side, visitors will be brought down a ramp and will enter the garden by travelling through a tunnel under the same bridge which will then open up to welcome you into a beautiful space full of fruit trees and flowers. Yew won’t be used as a hedge as it is too much of a cemetery plant, instead, hedges will be created using of fruiting plants. “If we can get kids into the garden and there are no apples left on the trees or no flowers left to pick then I will consider my job to be done and this project to be a success,” concluded Peter.